In the fall of ’71, I kept buying cards. I paid more attention to football than I did to baseketball or hockey. I only bought maybe 1 or 2 packs of those, but I bought football throughout the season. Only 2 series of cards to deal with, too. ty of the players. I might not have gotten Bobby Orr or Kareem Abdul-Jabbar, but I managed a Stan Mikita and a Calvin Murphy, among a few others. I’ll take THAT surprise when I went through a shoebox of old cards one day decades later after I’d forgotten about ’em. So I bought a lot of ten cent bubblegum packs of football cards in the fall of 1971, along with the occasional 25 cent 25 card box. I kept them separate from my baseball cards, and also kept the bonus inserts Topps threw in that season – a football card game with gain/loss play possibilities with stars on the cards, along with a small game board gridiron in each pack with the poster of some player on the back. They’d done a similar one for the 1968 baseball set. The baseball set that year had a set of metal coins with players on ’em, one to a pack, something they had also done back in 1964. I doubt they do multiple-platform sets like that anymore, which is too bad. Some years ago, I went through my boxes of old cards and started to organize them better, and came upon all my football cards, the bulk of which were the ones I bought in 1971. Turned out I had maybe 2/3 of the whole set, and most of the key cards in it. So I thought – why not complete the set? Ebay to the rescue – between some purchases here and there, I managed to track down the few dozen commons I needed, and the three missing slightly pricier “star” player cards I needed. 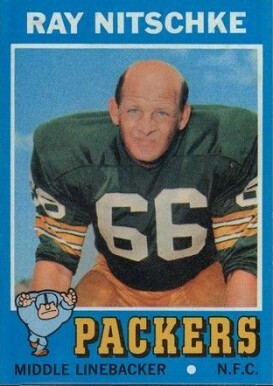 Ray Nitschke was the last one. Picked up an ungraded one in great condition for a couple of bucks, basically. AND he was in The Monkees’ movie Head! Ray’s about 35 in that picture, but he looks more like Ned Glass. He’d play another year in 1972 before retiring from a stellar career – winning championships with those Bart Starr Packers pre and during the Super Bowl era. The 1971 was his final Topps card, however. And now, my card set is complete… or is it? Truly completing the 1971 set meant completing the sets of football game cards & posters as well. Now, I had plenty of the game cards, one for every pack I bought. Not a big task to fill in the missing spots. I should also have the posters, one for every pack I bought, right? And THIS drove me nuts. I went through my entire sports collection looking for them and came up empty. So then I moved on to EVERY packed up box of Rhode Island stuff, stuff I’d boxed up literally DECADES ago and left in storage rather than unpack, and STILL came up empty. Oh, and the crap I found, from the guy who never throws anything away. I found papers and creative work dating from college back through elementary school. I found pay stubs from the very first paychecks I’d ever gotten in the summer of ’79. I found Christmas cards from 30+ years ago from people I’d long lost touch with. I found a promotional store map for Warwick Mall’s opening in Rhode Island in 1970. I found not one, but TWO mood rings – and they both still work. Before my parents sold the house I grew up in, I boxed up everything I could possibly try to save and had it shipped out to me in California. Sooooo much crap, each piece with a memory. And going through it now in 2018, I STILL didn’t throw anything away – whatever I examined all went back into whatever box I explored. I kept finding more and more things I’d forgotten I had. It dawned on me that I had allowed something of collectible value that I care about to be thrown away at some point in the irretrievable past. Certainly not a familiar feeling. While I eventually found everything on ebay and haggled it to a good price to complete the set for real, that feeling will never leave me. I went the FULL MARCEL PROUST over it, lamenting lost time. Even with my endless boxes of crap. 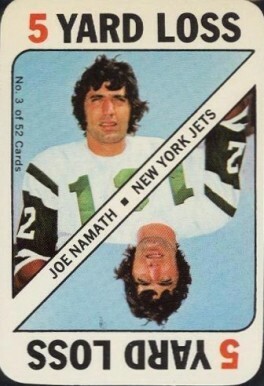 But I enjoy thumbing through my 1971 football cards. Joe Kapp played one season for my team, back in 1970. It was the coda to a long playing career, both in the US and Canada. Kapp’s the only QB in history to quarterback a Superbowl, a Grey Cup and the Rose Bowl. Topps Football cards could often be a year behind personnel changes back in the day. 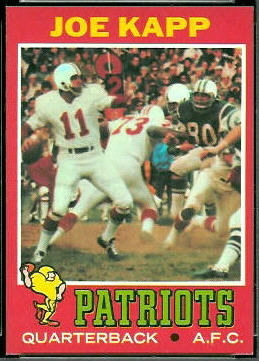 Kapp played for the Pats in ’70, but his ’70 card still has him on the Vikings. He got a 1971 Topps card because they had no idea the Pats would be so cruel and callous as to reject Kapp when he showed up to training camp the following season. I’m glad the ownership and management of my team has improved, never mind the STUPID DECISION not to play Malcolm Butler in the Superbowl. But they generally treat their players much better now. Anyway, Kapp sued them, lost, affected some changes in the way contracts were written, and wound up coaching his alma mater Berkeley. So it’s the only card of him on the Patriots. But none of ’em look like Ned Glass. Way to go, Ray!